Here we find the cosmic initiate pondering the significance of the sacred geometric shape known as the Star Tetrahedron. Within this three dimensional shape lies the energy and knowledge that holds all life together. From the energy field that surrounds the body, all the way down to the bonds between electrons, atoms and sub atomic particles, are tetrahedral in nature. The Tetrahedron is the first of five geometric shapes in nature that have face, edges and angles that are all congruent. The first is the three-sided pyramid known as the Tetrahedron and when two Tetrahedrons merge together; one pointing up and the other down, a Star Tetrahedron is formed, also known as a Merkaba. ‘Mer’ means light, ‘Ka’ means spirit, ‘Ba’ means body, Mer-Ka-Ba means the spirit body or radiant body surrounded by counter-rotation fields of light, a spinning vortex of energy as DNA, transporting the spirit/body from one dimension to another. 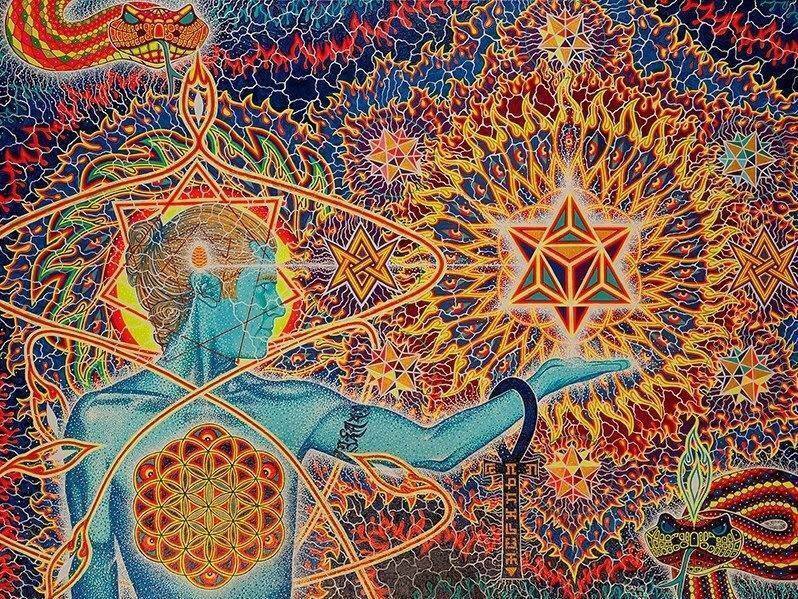 Merkaba is a divine light inter-dimensional vehicle used by ascended masters to connect with and communicate with those in other dimensions of light. The initiate by pondering the mysteries of life exerts a subtle influence on the evolution of our potential. By practicing being awake and aware of one’s self and surroundings, while receiving impressions in the process, increases the spin of electrons within his nervous system and organ of higher consciousness. This increase in spin can go faster than the speed of light and can exit time altogether, bringing more and more form to his radiant light body. For he is using life to gain impressions that enrich the complexity of his being while strengthening his spiritual power.